Sure, the difference between playing the PC version of a game on minimum and maximum settings is a big one. It's supposed to be. But the gulf between the less-intensive option for The Elder Scrolls Online and the all-of-the-things alternative looks massive. 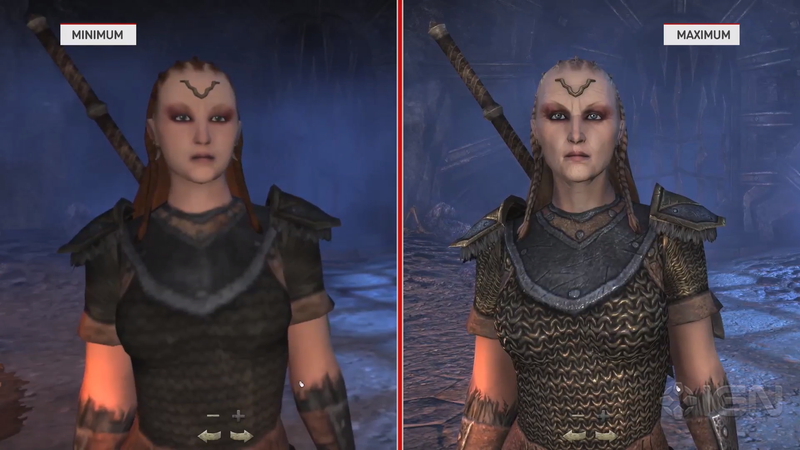 The side-by-side comparison comes courtesy of IGN, who ran the upcoming MMO with the graphics turned all the way up and all the way down. The advantage of a low setting, of course, is that folks with less robust hardware will still be able to play the game. But, there's no avoiding the fact that doing so leaves you with visuals that look like they came from two console generations ago. On the other hand, if you've got a set-up that can handle a more demanding graphics load, you're going to get a nice level of detail as you slash and spellcast your way through the upcoming online release. Set your components—and expectations— accordingly.